Tranent boss Max Christie hailed his depleted team as they clinched an incredible third cup final appearance in just two seasons. 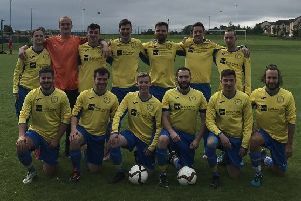 The knockout specialists beat Kirriemuir Thistle 2-0 in Saturday’s DJ Laing East of Scotland Cup semi-final at Foresters Park. The Premier League side, who won the Fife and Lothians Cup and the East of Scotland Cup last term, will now face either Penicuik or Dundonald in the final on June 9. Christie said: “It was a great win for the club because we were down to the bare bones with players on holiday or injured. Tranent’s goals came in the first half with Jamie Devlin getting on the end of a Kane Paterson cutback to score from five yards before Kenny Fisher produced a wonder strike. Striker Paterson wasn’t on the scoresheet but his overall performance was superb. He said: “Another cup final for the club is tremendous. I tried possibly too hard today but we were anxious that we didn’t let the club down. In the Super League, Linlithgow, who will finish second in the table behind champions Bonnyrigg, beat Carnoustie 2-0 with goals from Tommy Coyne and Alan Urquhart. Broxburn’s poor run continued with a 5-3 defeat at home to Dundonald. Despite goals from Zander Millar, Kieron Anderson and Nicky Locke, Dundonald’s Barry Sibanda was the matchwinner with four goals. Penicuik, perhaps with their eyes on Saturday’s East of Scotland semi-final against Dundonald, lost 1-0 at Lochee with Stephen McNally getting the only goal of the game. In a six-goal thriller at Newtongrange between Star and Bo’ness, it was the hosts who came out on top in a 4-2 win with Stephen Scott scoring a hat-trick. Premier League winners Musselburgh claimed a 5-2 win at Arniston. Mathu King kept up his scoring rate with a double to sit alongside goals from Bradley Donaldson, Steven McDonald and Sean Murphy. Third-placed Haddington lost 3-2 at Downfield despite goals from Andy Jones and Bob Berry.